Doug Holloway has over 32 years carpet and upholstery cleaning experience. Your First Choice for Carpet and Upholstery Cleaning in Essex. Welcome to 1st 4 Carpet Cleaning, your 1st Choice for Carpet and Upholstery Cleaning in Essex We are the Number 1 Truck Mounted Carpet Cleaning Company in Essex My name is Doug Holloway and I have been cleaning carpets and upholstery in Essex and London for almost 30 years. We have cleaned millions of square metres of carpet and many thousands of sofas and chairs. We use the best cleaning solutions and the most powerful equipment, which means your carpets will look good, feel soft and smell fresh. I previously worked as an Industrial chemist and the combination of my carpet cleaning experience, 8 years as an industrial chemist and many years of running a cleaning business means I can offer you the very best carpet and upholstery cleaning at a cost effective price. We usually use the hot water extraction method sometimes called deep steam cleaning. This will give you a nice deep clean leaving your carpets clean and fresh. It is also very effective at removing stains and smells caused by bacteria. 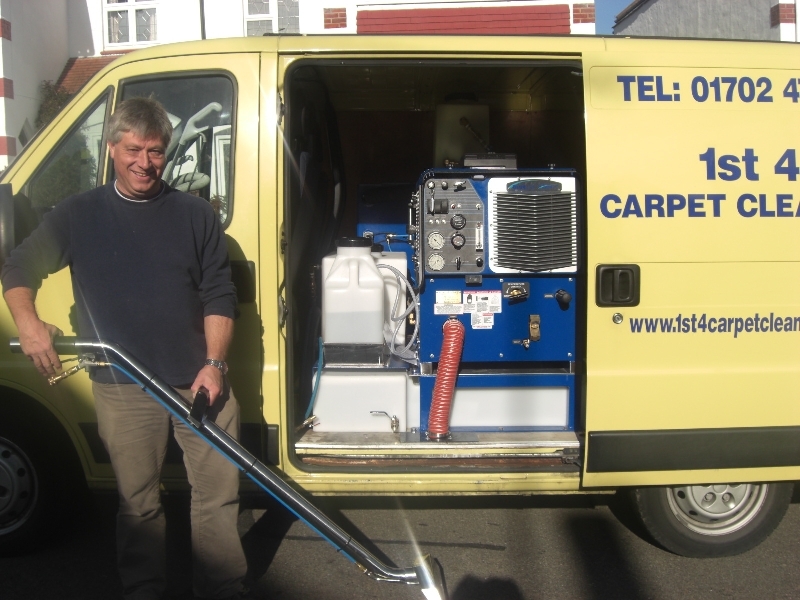 I have a Truck Mounted carpet cleaning system which will give you carpets which are much cleaner, drier and smell nicer. This is a 15K machine run on LPG which is simply much more powerful than any electric machine can be and will give you the very latest in cleaning performance, giving you brilliant cleaning and fast drying. If access is a problem I also have a portable machine and can still achieve really good results using this system. Dry Carpet Cleaning. If you prefer dry carpet cleaning we can use the very effective Dry 60 system which will leave your carpet clean and dry in 60 minutes. We have cleaned many thousands of square metres of commercial carpeting using the Dry 60 system, which leaves your carpets looking much cleaner, with none of the problems associated with over wetting and wicking. The Dry 60 system can also be used on your home carpets if you want fast drying.